This past week I had the opportunity to shadow some of Europe’s top Instagramers around the region of Marche in Italy. As we toured, explored and photographed Marche I couldn’t help but be over-awed by the natural AND man-made beauty of this place. If you’re someone interested in visiting beautiful destinations then you’ll love this stunning Italian region. So with that in mind, given the nature of our trip, the photogenic visuals of the region, and indeed the fact that Instagram (has for at least a year now) boasted over 100 million users, I thought it be useful to provide something of An Instagramer’s Guide to Marche. Even if you have no interest in the photo filtering/sharing app or travel photography, you will no doubt still be blown away by the incredible beauty at any of the points highlighted in this piece should you ever visit them! The following are 10 places or aspects of travelling in Marche that make me want to recommend this region as a place to go! The Temple of Valadier is probably one of the most stunning visuals in all of Marche. 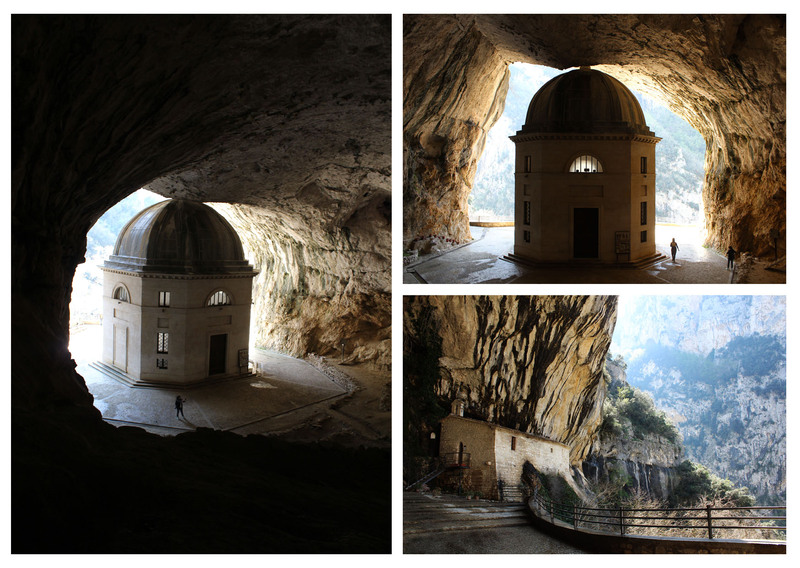 Its incredible photogenic quality comes down pure and simply to the location of this church – accessible only by foot within the mouth of a cave – and also how this man made structure blends in, yet stands out, so spectacularly from the natural environment that surrounds it. Designed by Giuseppe Valadier and built in 1828, is it quite frankly mesmerising and a joy to photograph! The temple is also measured exactly so that the tip of the cross atop the church touches the cave ceiling. I was truly blown away on every level. 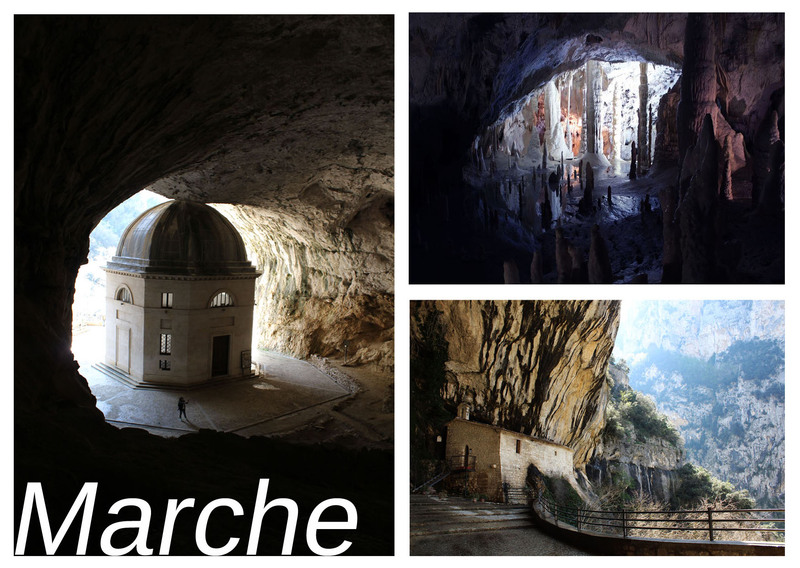 The Frasassi Caves are definitely the highlight attraction of any visit to Marche and the best part is they are an entirely natural phenomenon. It’s something you’re unlikely to see or experience on such a scale anywhere else in Europe. The caves here are known for their huge stalactites and stalagmites which fit into an area (which I was told) could also fit Milan’s Duomo quite comfortably inside too! They are something of a photographers dream… You’ll also have the opportunity once here to take part in an extra speleological adventure caving tour which provides the chance to go to a part of the caves where most tourists don’t usually roam. The speleological tour is also an activity much more suited to an Instagramer or someone taking pictures with their phone (versus a larger camera) as you’ll be squeezing through crevices and getting a little dirty in comparison to the more standard tour along the walk ways! The Teatro Comunale in Montecarotto is, by no means of an exaggeration, one of the highlights of the entire region. It also for me sums up the entire essence of Marche. On the outside this building looks rather quaint, blending in nicely with all other structures that surround it. Inside however it is a masterpiece, something entirely unexpected. Marche as a region in Italy continually has that unexpected wow moment effect on you, particularly when it comes to what’s inside of buildings towns and places once you delve a little deeper. On the outside it may look like a collection of quaint little villages (and in part it is), but there are many hidden gems of this region (such as this gem in Montecarotto) that are well off the beaten track compared to other nearby regions in Italy. The main features for me of this building were the artistic interior design and decorations. In particular the hugely impactful stage curtain, ceiling and chandelier were something any Instagramer or person interested in taking great travel pictures will adore. Valle Scappuccia is yet another cave like formation in Marche and is also one of those places that you’d only know if someone took you there or told you how to get there – which is great for travellers looking to get off the tourist trail a little bit and see something beautiful! The way the light trickles through the cracks in the formations of the rock also presents itself with some fantastic opportunities to take dramatic contrast-filled photographs. See the natural spotlight portrayed in the picture above by Instagram user @Joanna who was one of the top Instagramers on our trip for an example of just that. One of the subtle joys of Marche was being able to meet local people out and about so easily in collections of little villages, particularly in those close to the town of Arcevia. Whilst of course this great region has a mixture of age ranges in terms of the people who live there, it is the elderly people who were for me the most endearing characters of the entire destination. With the sunshine out you’d merely have to walk over to a main square or down a cobbled street to find figures walking by or sitting out enjoying the sunshine that you could either converse with or indeed take a photograph of (with permission in case of the latter of course!) It may sound like a simple thing to do but coupled with the larger attractions of the region this was a rather charming aspect of travelling here. Marche is a region filled with rolling green hillsides and spectacular scenic views. The hilly nature of which many of the local towns and villages were built on, frequently presented itself with many easy and natural viewpoints to look down from. It was so easy to get lost in the villages of Marche, wandering out without a map, getting out there and discovering parts of towns and villages you never would have otherwise. It was a treat to wander down dark cobbled streets and alleyways and find secluded little paths with such peaceful and character-filled atmospheres. The humble and historic nature of the streets provided a tranquil atmosphere that had you feeling almost like you’d been transported back in time to a place from long ago. For me I just couldn’t get over the colour and clarity of this river! In most destinations I visit around the world, when you visit a river – particularly downtown – you’ll usually find it’s pretty dirty and not such a nice colour compared to other natural water formations you can visit. The complete opposite can be said about the River Sentino in the towns and villages of Marche! It was beautiful. A great sight to see and a great place to photograph or even just watch as you have a rest or picnic outdoors! I don’t usually expect to write about hotels when I’m talking about visual imagery, but Hotel Le Grotte in Genga (near the Frasassi Caves) was definitely one of those wow places to stay in many respects. Particularly when it came to the swimming pool, spa, and food, you couldn’t help but get your camera out and start snapping away. It’s one of those places that offers a tranquil moment of luxury without being too overbearing or clashing with the local landscape. Whilst I’m usually a budget travel kinda girl, I do believe in treating yourself once in a while, and if that sounds like something you’d also like (and you’re planning on going to Frasassi) then I’d definitely consider booking this hotel! Even if just for the food alone! It was fantastic! – Marche was one of those surprise regions for me and an example that there is much to see and do in Italy beyond the main cities and sights that are more well known. The food was amazing, the local people endearing, the caves spectacular and the historic sights and scenery beautiful to photograph. Regardless of whether you’re a photo-totting traveller or not, this is definitely one region that should be on your radar for off-the-beaten-path ‘spectacularness’ in Italy! However, if like me taking photographs is something you love to do on your holidays/travels, then you’ll love this region even more! Oh and if you’d like to see all of our photos from this trip to Marche the you can view them at the Instagram hashtag #exploringmarche2. Great piece on our Trip, Jane. I want to go back! What a beautiful region … I love Marche ! A church in the mouth of a really big cave? That sounds wild, and combined with the rest of the sights in Marche, it adds up to a time I’s love to have in Italy!